Interviews with online daters on behalf of Yahoo! 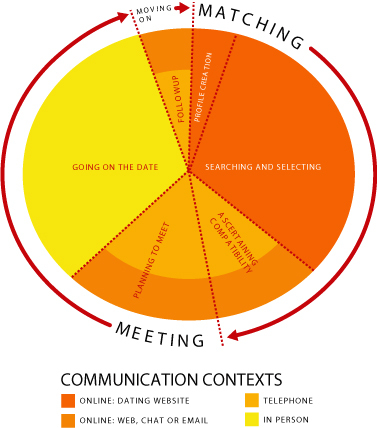 Personals identified service design opportunities for helping daters move from online interactions to first dates. 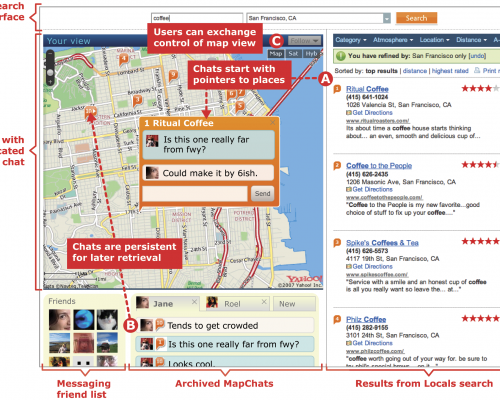 The result: MapChat, which combines local listings, chat, and maps. 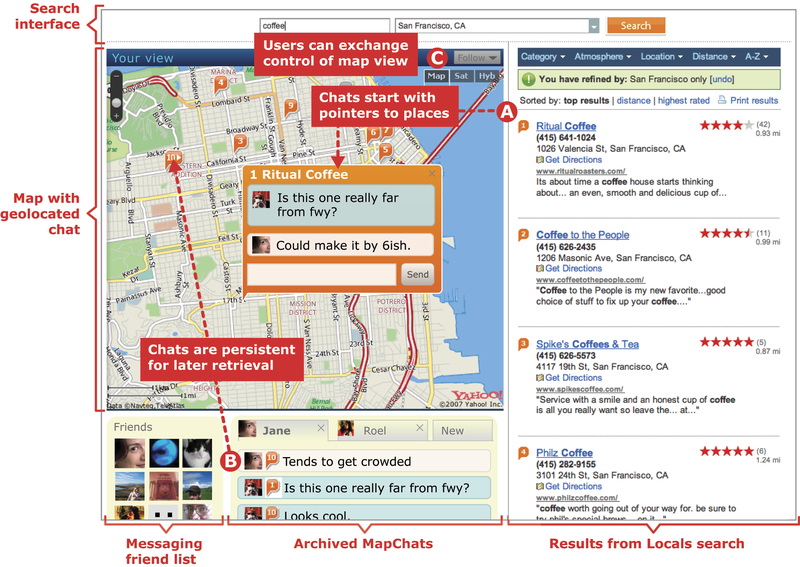 MapChat was deployed in beta through Yahoo! Labs in 2008, and resulted in a patent. I led experience research on the project, visualized the results as experience models, and created initial interaction and visual design specifications. 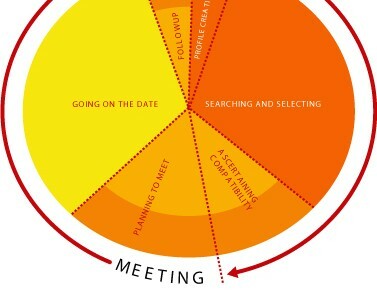 Visualizing research findings: the cycle of matching, meeting, and moving on. I’m giving a guest lecture at Expressive Motion in Art and Design, a graduate class in UC Berkeley’s Architecture dept. 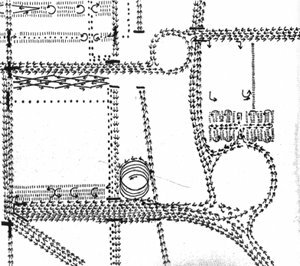 Featured image excerpted from Louis Kahn’s map of traffic flow in Philadelphia. From Alison Smithson (ed. ), Team 10 Primer (The MIT Press: Cambridge, 1968), p. 53. 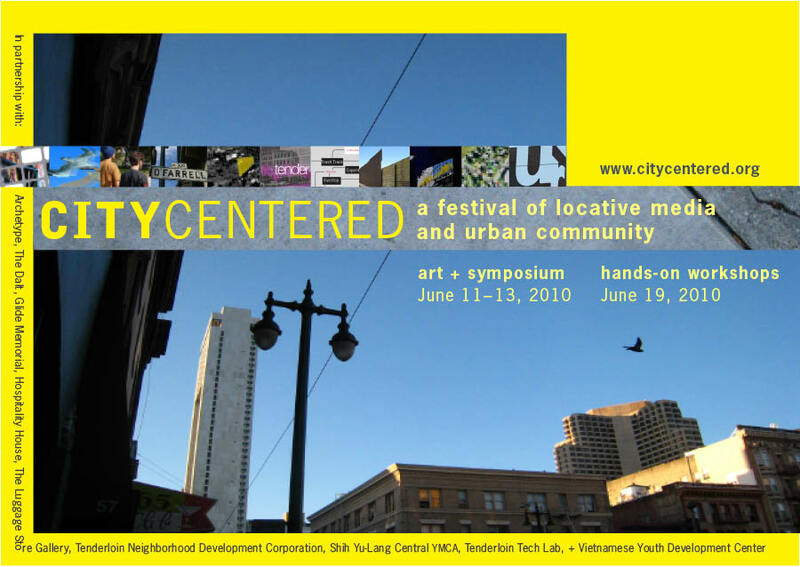 In 2010, I co-organized City Centered, a free, three-day festival of locative media and urban community in San Francisco. The event included demonstrations and installations in the Tenderloin district, a symposium in the Mission district and community training workshops. The art festival, which I co-curated, included contributions from MIT’s Senseable Cities Lab and Stamen Design. Over two weekends, it engaged artists, educators, civic organizations and community members of all ages in exploring how how locative media can act as a platform and venue for community-led expression. Churchill, E., Goodman, E., and O’Sullivan, J. 2008. MapChat: conversing in place. In CHI ’08 EA: 3165-3170. Goodman, E. 2007. 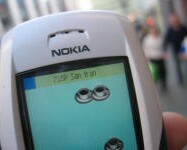 Destination Services: Tourist Media and Networked Places. 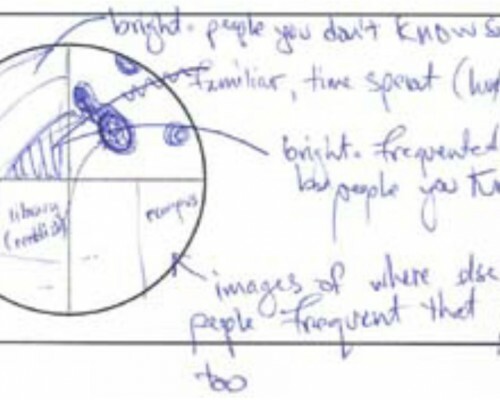 UCB I School Report 2007-004, UC Berkeley. As humans we come to understand the places around us using a myriad of observable cues, such as public-private, large-small, daytime-nighttime, loud-quiet, and crowded-empty. Unsurprisingly, it is the people with which we share such spaces that often dominate our perception of place. Sometimes these people are friends, family and colleagues. 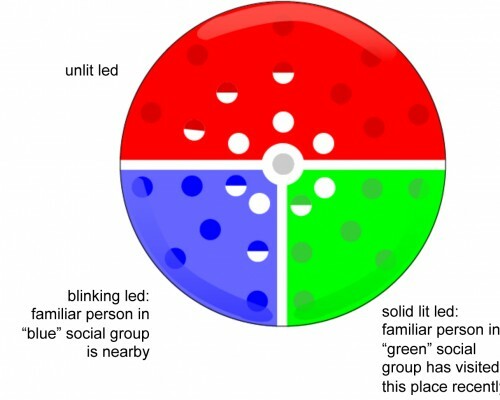 More often, and particularly in urban public spaces, the individuals who affect us are ones that we repeatedly observe and yet do not directly interact with – our Familiar Strangers. 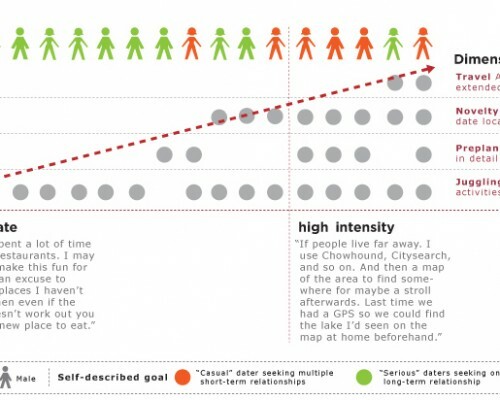 This research project explored the often ignored yet very meaningful relationships with Familiar Strangers. 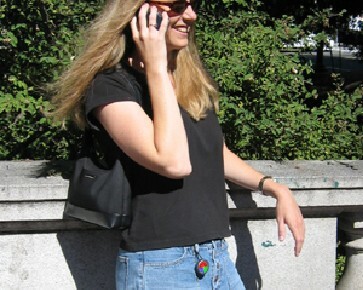 Several experiments and studies led to a design for a personal, body-worn, wireless device that extends the Familiar Stranger relationship while respecting the delicate, yet important, constraints of our feelings and relationships with strangers in public places. Sponsored by Intel Research from 2003–4, with Eric Paulos. 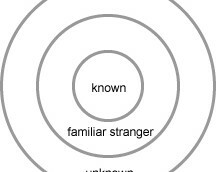 What is a familiar stranger? 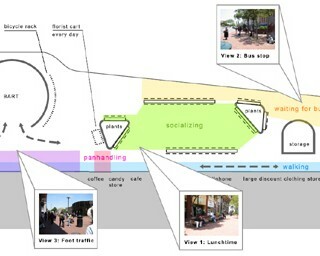 Mapping zones of interaction in a public square in downtown Berkeley. 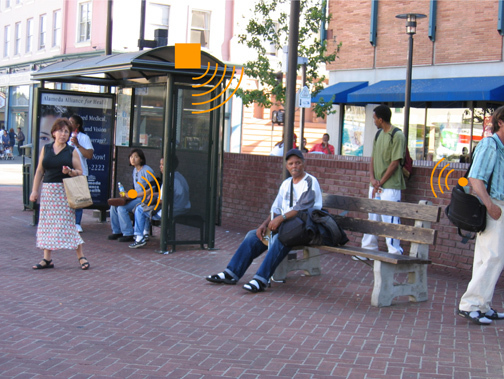 Redoing the classic study by Stanley Milgram that established the concept of "familiar strangers" – this time in downtown Berkeley rather than New York. 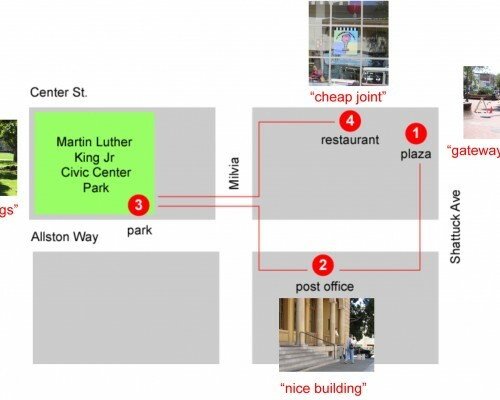 A walking tour of downtown Berkeley to investigate the relationship of place and crowds. 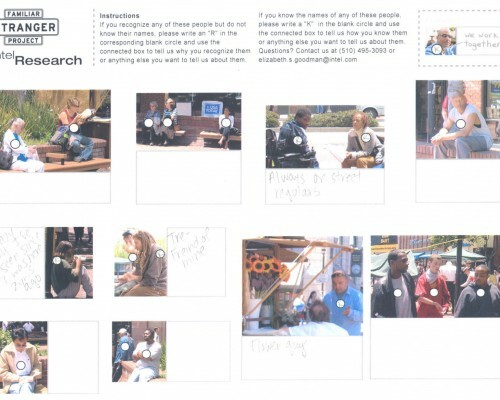 Results of co-design exercises to explore how to visualize familiar-strangers on a small, wearable display. Low-power display for a wearable "mote" or mesh sensor node. 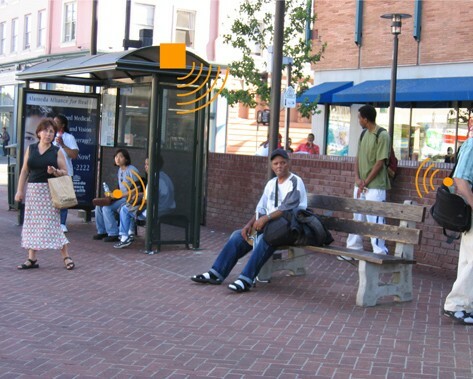 Imagined network of wearable device / stationary beacons.